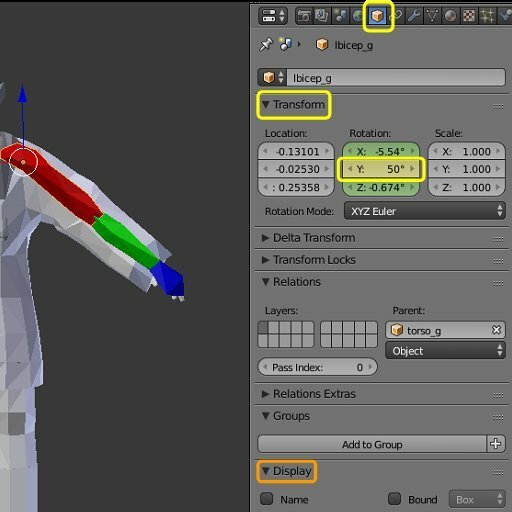 This is a step by step tutorial on how to rig a model (= a "skinmeshed" model) for NWN1 in Blender (2.79) using Neverblender. Though it does show the way for NWN1, the general rigging part is, of course, usable for any system, e.g. NWN2! The plan to create a tutorial was announced some weeks ago and I finally managed to finish it. English is not my native language, so you might stumble upon weird sentences, grammatical or spelling mistakes. But I hope, that it’s understandable enough. It has gotten quiet long. This is due to the fact, that I wanted to write it also for Blender newbies and thus I used many screenshots and a lot of explanations! But don't let you be frightened away by the number of pages (58 ATM)! It doesn't take too many steps to get a basic weighting and once you wormed yourself through this, a basic (automatic) rig should be managable in a much shorter time period! A BIG THANK YOU goes out to Symmetric, who not only improved his Neverblender tool while I was trying to do a NWN1-rig, but also supplied me with tons of information and findings on how to accomplish certain things in Blender, which I knew how to do in Gmax, but not in Blender. Two simplified human NWN1-templates based on a_fa and a_ba. 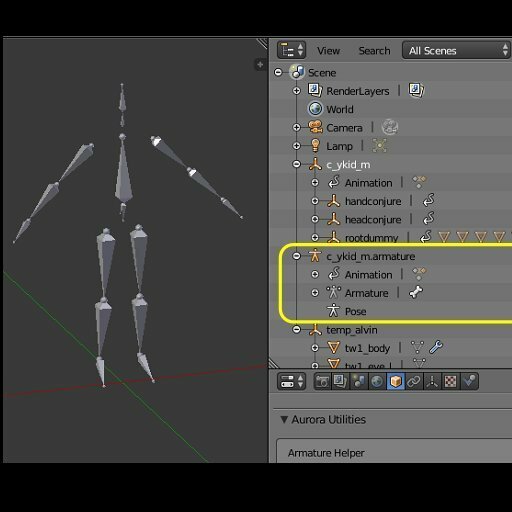 You can use these for humans to create the Armature and, later on, to link your skinmeshes to - for the NWN1-export. They have the original animations. Ignore those "Shield-"ones They only animate a part of the upper body. The walking is drawn from another supermodel. There are enough others to use to check your rigging. If an animation of your model is not working IG, you might have to set the supermodel to a_fa/a_ba, because they are drawing on other supermodels and their animations. 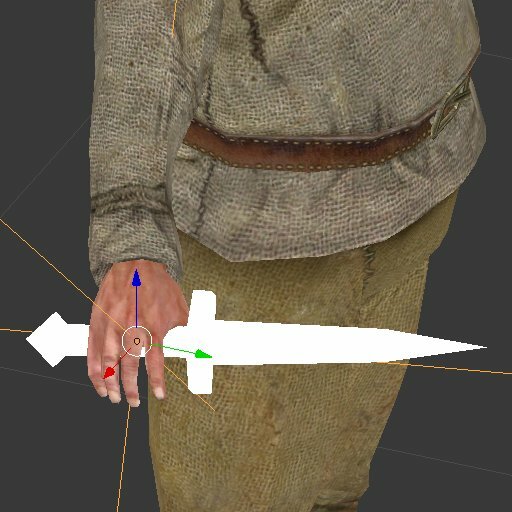 Exchanged the a_fa / a_ba templates (= now version 2): They now have dummy daggers and shields (all = small, large and tower), which make it much more easy to position the item nodes after rigging (see page 42/43 of the manual). Of course, they will not render, nor cast shadows (= turned off). To position the weapon/shield nodes, select the according dummy of the NWN1-model (e.g. rhand, lhand = weapons / lforearm = shields) - NOT the item or the empty/dummy of the item! - and move it. "Neverblender supports all new parameters: Normals, tangents, colors (vertex colors), materialname, renderhint, multiple tverts (uv maps) and multiple textures. 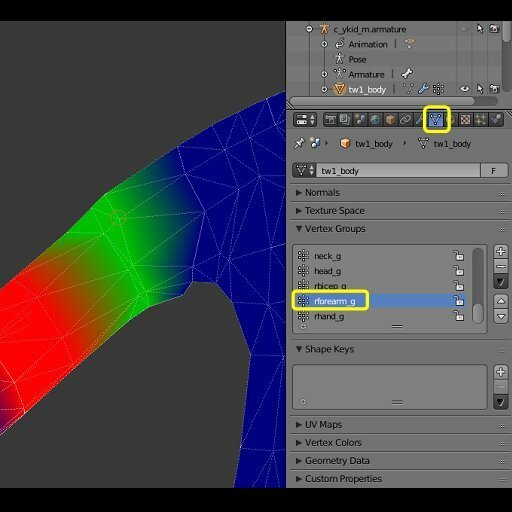 You'll need to enable the checkbox "Export Normals and Tangents" in the export options for normals and tangent support (disabled by default atm)"
Please report anything, that is not correct or unclear, so I can update the tutorial, if necessary. I just added two simplified human NWN1-templates (see description in the main text body). And as an info: I'll be gone for vacations starting this thursday, so I probably won't be able to send any replies. -> I'm back. This is an excellent, well-illustrated tutorial, and those a_ba and a_fa bases are bound to be extremely convenient for a lot of things. 59 downloads so far! THANK YOU for checking it out! So, did it work out for you = those, who tried the tutorial? That would be very intresting for me! 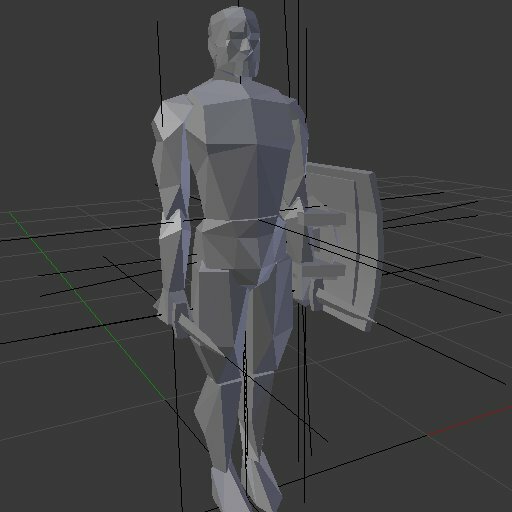 I exchanged the a_fa / a_ba templates (= now version 2): They now have dummy daggers and shields (all = small, large and tower), which make it much more easy to position the item nodes after rigging (see page 42/43 of the manual). I'm still hunting that export bug when not at frame 0. No clue why that sometimes happens. If everything else fails I'll just add another export option to set the frame to 0 - it could be useful to export at the current frame so I want to keep it as an option. 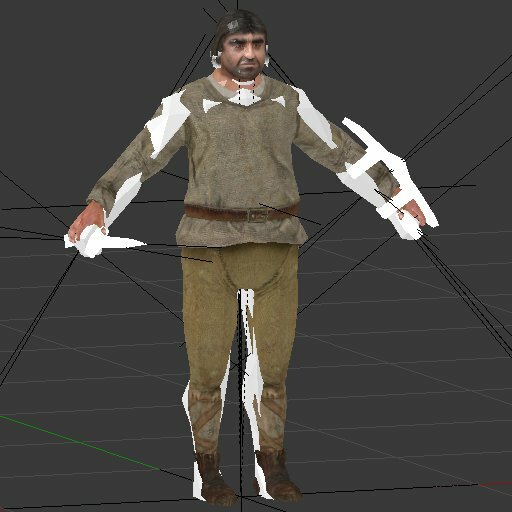 Fimbul and I found an issue with NWN:EE: If a skinmesh has no uv-map/tverts it will not be deformed at all. Should people want to test their rig in-game without textures they'll need to add at least some placeholder uv-map. This also applies to skinmeshes without textures at all - just sayin' in case someone wants to do that. That is new behaviour in NWN:EE (at least currently, July 2017, v1.76). It works fine in 1.69. Awesome! Hit 100 downloads! Again thank you to all, who give it a try!!! And I'd still be glad, if some of you find the time to give feedbacks, like if this works for you or if I missed something. The "Apply Transform Helper" (which is "ResetXform" in Gmax) works only on the chosen/active model = Everything, which is linked to that Aurora Base and NOT everything in the scene. - Thanks Symmetric! Hi, I tried using your simplified_a_ba.mdl as a base for my project but it appears I ran into the same problem as with decompiled vanilla a_ba: parts of some custom content robes become rigid, like this CEP robe: http://tinypic.com/view.php?pic=289v2pc&s=9 Do you know what might be the issue? Note that image was taken with only simplified_a_ba.mdl as a_ba.mdl in override. That might be the case. 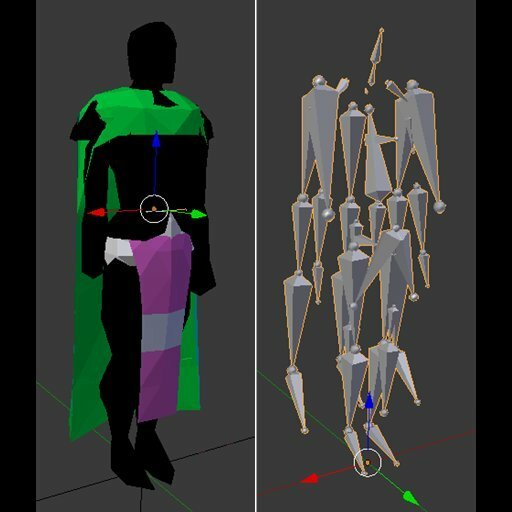 Your model geom doesn't have robe and cloak nodes. It's still puzzling why just decompilation of vanilla a_ba causes the same issues. Thanks.